Is a mobile phone all about communication or about fashion? Nokia decided it was about fashion when the company sponsored London Fashion Week in 1999 and offered two Nokia 5110s as prizes in a competition. The Nokia 5110 was not Nokia's first attempt at a consumer phone, but for the first time they decided that a consumer phone was more than a business phone with a few features missing. The Nokia 5110 gave customers a chance to choose a phone that was not just black or grey. 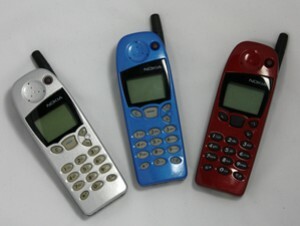 The Nokia 5110, thanks to Nokia's new Xpress-on covers, could be any colour you like. The Guardian fashion editor loved it and it won the 'Off the Cuff' (Fashion) Accessory of the Year Award 1998. Nokia had jumped on a trend that started in the mobile phone accessories market. People were buying new covers for old phones. If you had the skill and patience to prize apart your old mobile, you could change the case from the standard grey or black to red, yellow, green, transparent or polished walnut. The Nokia 5110 made it much easier to swap covers, as the phone was designed for it. Nokia were not quite the first to do this. The Ericsson GA628, launched the previous year, had a fascia panel around the keypad that was customisable, but Nokia was the first to do it with the whole of the front of the phone. 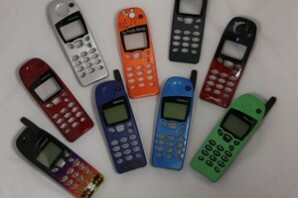 There was a huge range of official Nokia fascias and plenty of aftermarket ones with varying degrees of quality. 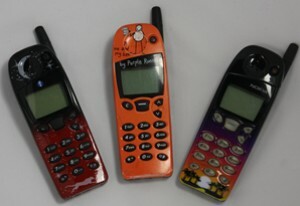 The picture on the right shows two phones with aftermarket fascias, the orange one in the centre has a cartoon by Purple Ronnie. The phone on the far right has an official Nokia facia. The Nokia 5110 started the craze for phones with changeable cases from the late 90s and early 2000s. The Nokia 5110 became a fashion favourite. However, it was a mid range rather than a premium phone and quickly lost its edge. By 2000 The Link offered the Nokia 5110 free with free line rental for a year and Comet offered the same phone for £79.99 on 'Pay as You Go'.